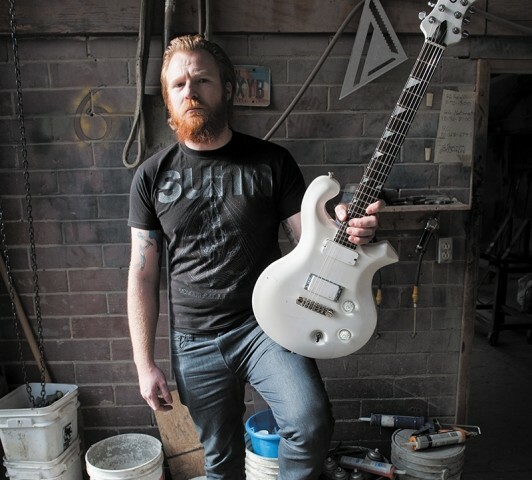 “If there’s one thing I’m gifted with, it’s working with my hands,” says Mike Mason, local craftsman and guitarist of Cult Leader. Mason comes from a family of builders and mechanics and learned the value of understanding the way things work. “My whole life has been around mechanical things,” he says. “My dad and grandpa drag raced. Stuff like that mattered.” He is fascinated with mechanical engineering and advanced mathematics, fields that help him break a thing down to its base elements and build how he sees fit. It is this natural curiosity and intellect, combined with a love of music, which led to the beginning of Mason Guitars. Based out of Syracuse, Utah, Mason’s shop offers everything a guitar player could need, from repairs and setups to building custom instruments from scratch. Mason began playing guitar at age 14 and almost immediately brought his natural predilections along by tinkering with and customizing his guitars. He has owned and played many different brands and types, valuing them equally as tools for particular tasks. Eventually, he decided that he wanted to go further by trying to build his own guitar from start to finish. 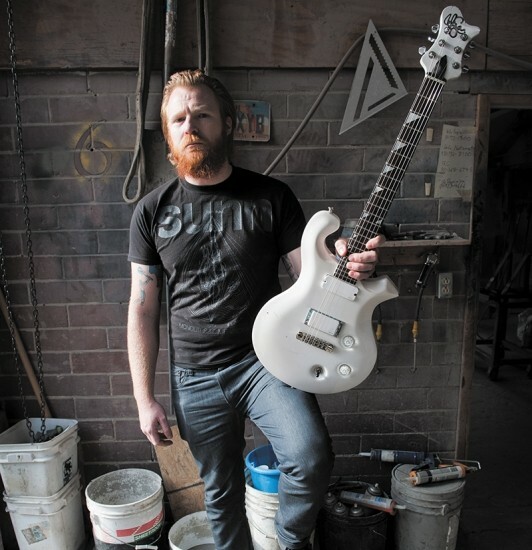 “I had an idea one day that I wanted a whole bunch of different guitars [built] into one, and I’ll just build it instead of finding someone to build it for me.” Mason took up woodworking to address the gaps in his knowledge and is now able to create highly customized instruments with a variety of options, as well as other woodworking projects such as furniture and cabs. The shop website showcases several of his projects, including a beautifully curvy mahogany and maple electric guitar with an East Indian rosewood fretboard and mother of pearl inlays, and a monster-green “dragster-themed” rig with an exhaust valve embedded in the body. So far, his builds have been exclusively electric outside of a few repairs on acoustic guitars, but Mason looks forward to his first acoustic build. Clients who choose Mason Guitars can expect a personalized, custom experience, with as little or as much variation as they desire, from the beginning woodworking stages all the way through paint and cosmetics. As a builder, “the most important thing for people is to be comfortable when they play,” he says. For Mason, this means analyzing specific things about the guitar players themselves, such as the way they play and what tone they are trying to achieve. “The biggest thing is someone’s hands,” he says. “That’s the biggest influence on tone. Some people have a steep angle of attack, [and] some people play really light. The people who have mastered playing guitar have figured out how to manipulate tone with their hands. It’s a beautiful thing.” Despite the seemingly exhausting amount of variables involved, Mason says that the process is enjoyable for him. “I’ve spent enough time figuring out what I want to do that I don’t have to second-guess what I’m building when I do it.” Pricing for a custom build varies depending on the customer’s choices, but starts at $1,800. Anyone interested in procuring Mason’s services or browsing through his gallery of finished projects can contact the company at msmguitar.com or msmasonguitars@gmail.com. The company also has an Instagram account, at @michaelscottmason.